The jam part of the tart was easy - the layers are sandwiched together with raspberry jam and fresh raspberries (I couldn't resist adding them). The cake caused a bit of trouble but in the end I got a sponge that still screamed ALMOND and had that satisfying dampness. 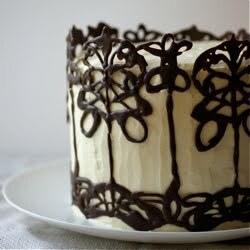 I couldn't work out a way to incorporate pastry, except for making a decoration - which I decided against. Though the original tarts don't have icing, I wanted to use some to get a proper layer cake look. I thought about an almond buttercream or similar, but I really couldn't face it in this summer heat and I also wanted something light to complement the richness of the insides. Whipped cream scented with almond seemed like the perfect answer (and I reckon traditional Bakewell Tarts would be yummy with a dollop of whipped cream on the side). The first time I came up with a recipe to make this sponge, it was an epic fail. There was a volcano of batter-lava which went all over the oven, it was greasy and basically just plain nasty. I decided to change my base recipe to Delia's All-in-One and thankfully that time I managed to sort it out and they came out really well - light but still damp and with a clear almond taste. A certain somebody below tried to help me by getting his nose in the way while I was making this. 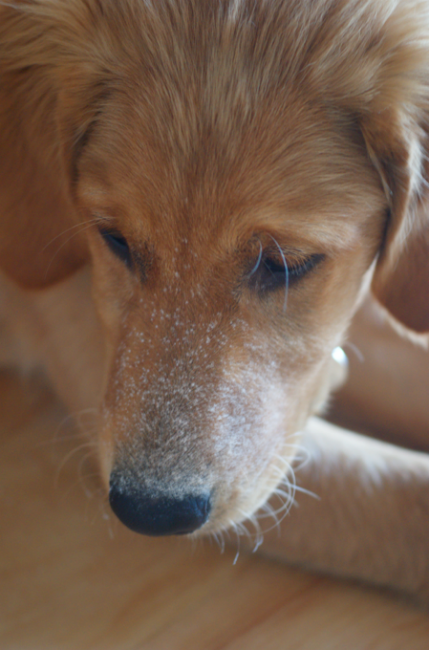 He then had an argument with the sieve and got a good dusting! 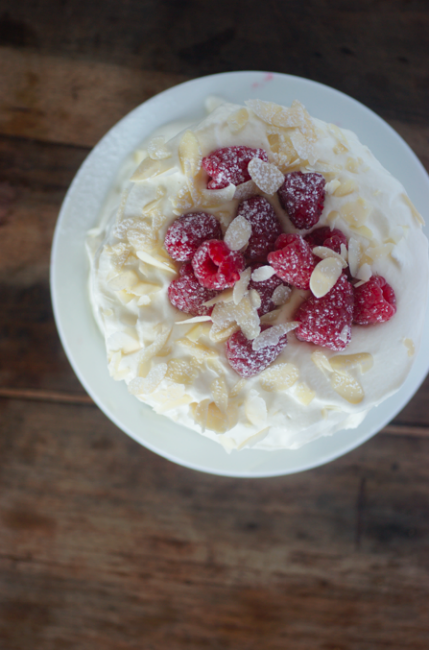 It all came together nicely in the end: a clear hit of almond from the cake contrasted with the rich jam and tart berries and lightened by the soft whipped cream which gave off a scent of almond. Perfect for a summer afternoon tea! If possible, it would be best to make the cake the day before you need want to serve it to let the almond flavour develop. Just pop it in an airtight tin then assemble it when you're ready. Also, try to use a good quality almond essence/oil - it makes a difference. I made this a 5" cake - if you want to go for a 9", I would just double everything and see how it goes! I really love making small tall layer cakes - I couldn't recommend getting small tins enough (I have 5" and 6" ones from Alan Silverwood - they're on Amazon), especially if you don't have masses of people to feed. Preheat the oven to 170C. Grease two 5" tins (or one and simply bake one after another). Cream the butter and sugar together until light and fluffy. Add the eggs, flour, almonds and baking powder and beat until well combined. Add the almond essence and briefly beat in. Divide between tins and bake on a medium shelf for about 20-25 minutes or until golden and a toothpick comes out clean. Leave to cool in the tin for 5 minutes before turning out onto a wire rack to cool throughly. Slice each cake into two. 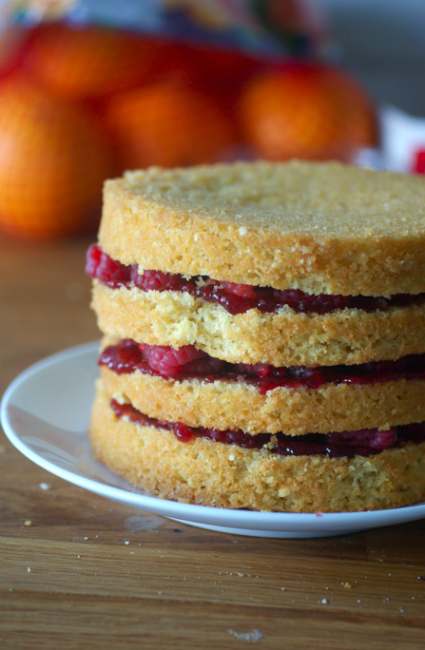 Place one cake on the serving plate, cut side up (reserve the nicest half for the top - the bottom half is often neater). Spoon on a tbsp of raspberry jam and spread - add more if you think you need it. Reserve a handful of the prettiest raspberries to decorate. 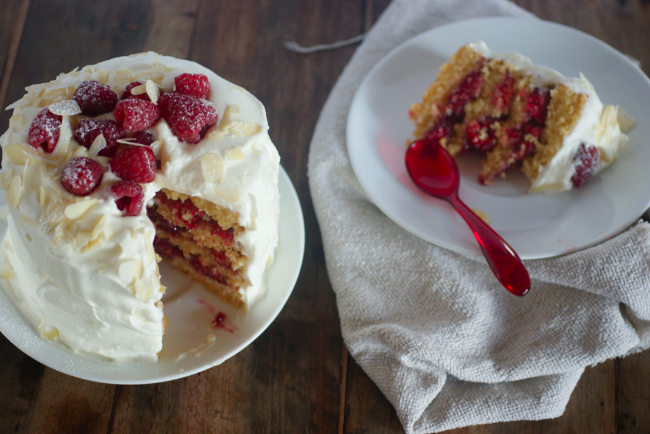 Cover the jam with raspberries, slightly squished - you could cut them in half to make them go further and have a neater, more stable cake. Top with another cake and repeat, the another cake and repeat. Place your final cake on top. You may find it useful to use a few toothpicks as dowels to help the structure - just remember to take them out! Whip the double cream until fairly stiff, then add the almond essence. You could also add a tbsp of icing sugar if you like - I prefer mine unsweetened. Whip a bit more until it forms a good beak when you remove the whisk. Spoon about half the cream on top of the cake, then start working it down the sides with a palette knife. Add the rest of the cream when you need it. It's difficult to work with and doesn't behave particularly well, but I promise it's worth it. 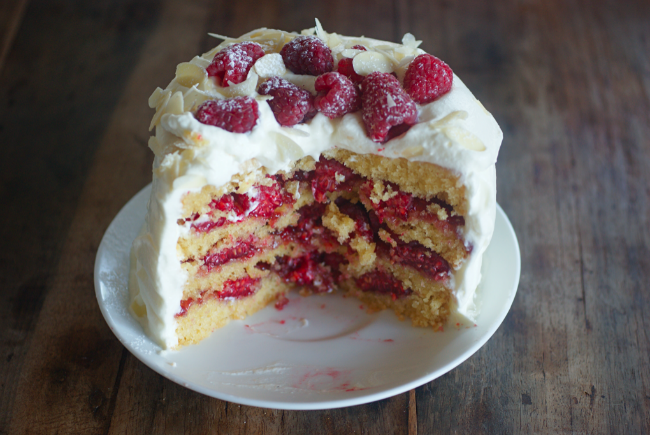 When you're satisfied, top with the reserved raspberries and the handful of flaked almonds. Best eaten the day you put it together because of the cream. I love anything almond flavored. These sound and look fantastic. I'd never have thought to be inspired by a tart to make a cake. Bookmarked! I love almond and tart fruit together. This looks lovely, and perfect for a birthday cake for my mum who loves Bakewell tart! Today is the first day I have stumbled upon your blog, and I am SO impressed. It's beautiful and full of delights! What an incredible looking cake! I'll be making these for my mom's birthday tomorrow. I'll be adding more almond meal and omitting some of the flour. I'm really excited for the outcome! I hope it goes well! 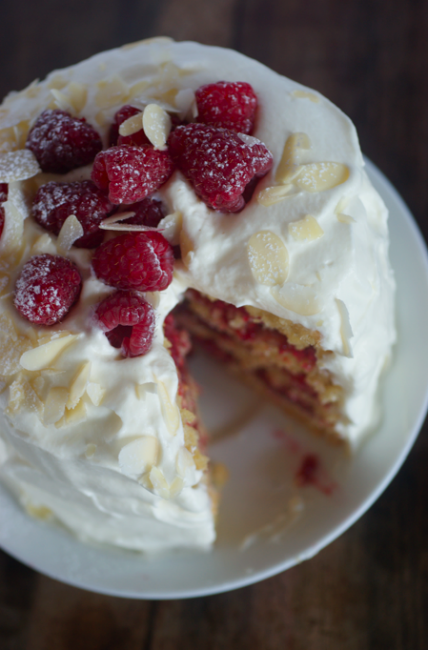 I wouldn't swap too much of the flour for almond in this recipe as it should still be a light sponge (and the almond makes it heavier) and more almonds can make it oily. Do let me know how it goes. That looks amazing, Shaun! I love it when people post pictures. I'm so pleased you like the recipes - I think I need to make the Malteser cake again, it's been too long. So pleased it went well! Happy birthday to your daughter. I made this cake for my birthday this year (together with my man) and we absolutely loved the cake! It was my first ever layer cake and since your recipe is so good, I think it turned out very pretty and tasty!